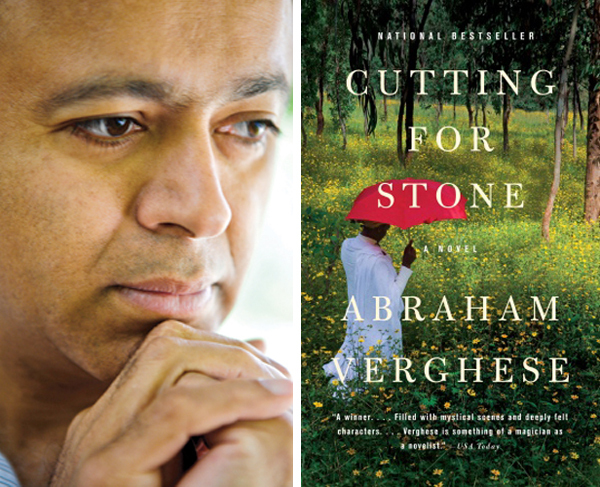 Martha's book selection for the "Book's I'm Reading" Club this month is 'Cutting for Stone' by Abraham Verghese. Have any of you read it? It is an epic medical love story that gripped my attention right off; it is immensely interesting. The author who is also a doctor uses absolutely beautiful storytelling to share the life of twin boys that end up being orphaned by their mother's death and their father's disappearance. The story evolves and spans generations and continents and is about the journey of coming of age, love and family relationships. It is an excellent piece of contemporary literature that is topping reader charts (it has been on the New York Times' best seller list for a year -- currently number four) and there is even talk of a movie. I can't wait to finish it on my Sony Reader they provided me. As for the Sony Reader, I am a big fan -- it has exceeded my expectations in many ways with its simple pocket size, ease of use, and the ability to carry around with me thousands of books on one device. What about you? What are you reading lately? Join Martha and us reading Cutting For Stone if you need a great novel. *Enter to win a Sony Reader here - there is a winner each week! You just inspired me to go pick up this book. I'm always on the hunt for something new and interesting to read. I just finished a book on Julie Andrews called, Home, and completely loved it. I would definitely encourage you to check it out. Adding this to my to-read list. Right now I'm reading A Tree Grows in Brooklyn. Never read and I'm really enjoying it. I have been looking for a good book...haven't found one since Pillars of the Earth......thanks for the tip! This book is BEAUTIFUL! What an inspiring man and totally engrossing story! I JUST finished reading this book. I don't read a ton of fiction; I'm a journalism girl, but I LOVED this book so much! I felt like so much of it read like poetry rather than prose. Now I'm reading his memoir, also good. i think i have this book, people give me so many books i can't keep track:D but if so, i'll definitely read it. thanks for the recommendation. Isn't it a fabulous book? A lot of friends suggested I read it and I'm so glad I did. The writing is fantastic and the story is capitvating. I am currently reading this and love it! His writing is so beautiful, very lyrical in rhythm. This book sounds fascinating! I think this will be next on my docket of books to read. my mom is reading it for her book club and can't put it down! i hope i can find it here in my italian bookshop!! I just picked up "Cutting for Stone" and can't wait to dive into it. I am currently in the middle of The Distant Hours by Kate Morton. It's perfect for a cold, windy night. marther doe have a reall good opinion here, prints and so forth like photo canvas pictures are usfull to do you not think. LOVED this book. One of my all time favorites. I find that when I talk about it my hands are over my heart. I'm getting curious about the book readers. I've heard the Sony reader feels more like a book than some of the others. I've read it last year and loved it. Very original and with fascinating characters and stories. Made me want to learn more about Ethiopia. That sounds like a good read, perhaps I'll look at it when I'm maybe halfway through my current "to read" pile! I just finished A Prayer for Owen Meany, which I know I'm late to the game reading. Now, I'm reading North & South by Elizabeth Gaskell. I loved the BBC series, and decided I should probably read the book. FAITH AMOUNG SHADOWS, One Cuban Soldier's Journey to Find the Gospel of Christ. By Malcom Leal.